Manufacturers Part Number: EXH005. Powerflex Bushes. About Powerflex. However that is not the whole story. When you consider the cost of fitting new bushes and the fact that POWERFLEX will be the last bushes you every fit to your car things start to look a bit better. Powerflex Exhaust Mount's. Ideal for Performance Exhaust Systems. (SET OF FOUR). Fits Mk7 and Mk7.5 Ford Fiesta. 4 x EXH005 Exhaust Mount. Secures all full turbo back exhaust systems! All parts shown are included in the kit. 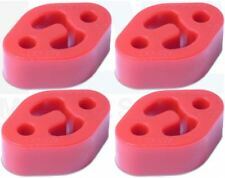 VW Golf MK3 GTI VR6 TDI Powerflex Exhaust Mount Hanger Bush Poly Syncro Performance. As your vehicle ages or is driven hard, you may start to experience imprecise handling, uneven tyre wear or unstable braking. Part Number: EXH008. Make: Vauxhall. Model: Astra MK2 (85-91). Powerflex Exhaust Mounts for: Peugeot 306. Unlike old technology Poly bushes any increase in vibration / harshness felt through the vehicle is normally undetectable. Manufacturers Part Number: EXH016. Powerflex Bushes. About Powerflex. However that is not the whole story. When you consider the cost of fitting new bushes and the fact that POWERFLEX will be the last bushes you every fit to your car things start to look a bit better. Powerflex Exhaust Mounts for: Subaru Legacy BE & BH (1998 - 2003). Unlike old technology Poly bushes any increase in vibration / harshness felt through the vehicle is normally undetectable. Ford Fiesta ST - Powerflex exhaust mount. Size A=71mm B=50mm. Fits Mk2 Ford Focus ST225 & RS MK2 2009. 1 x EXH013 Exhaust Mount | Centre Section. 3 x EXH003 Exhaust Mount | Rear Box. 3 x EXH015 Exhaust Mount | 2 For Down Pipe | 1 For Cat Section. Secures all full turbo back exhaust systems! Ideal for Performance Exhaust Systems. Upto15% Stiffer than the OE Rubber. 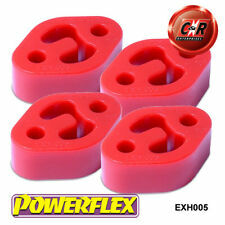 Powerflex Exhaust Mounts for: Ford Orion All Types. Unlike old technology Poly bushes any increase in vibration / harshness felt through the vehicle is normally undetectable. Manufacturers Part Number: EXH011. Powerflex Bushes. About Powerflex. This in turn causes accelerated tyre wear, braking instability and poor handling. Can I fit POWERFLEX bushes to my racing car?. 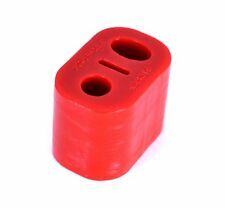 If your race car has rubber bushes anywhere in the suspension then fitting POWERFLEX bushes will improve all aspects of it's handling. 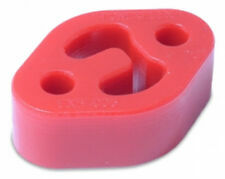 POWERFLEX Exhaust Hanger Bush. 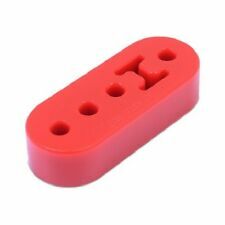 Lengths between mounting points are 40mm, 60mm, or 80mm. Cut to suitable length for your car. This does not affect your statutory rights. Manufacturers Part Number: EXH008. Powerflex Bushes. About Powerflex. This in turn causes accelerated tyre wear, braking instability and poor handling. Can I fit POWERFLEX bushes to my racing car?. 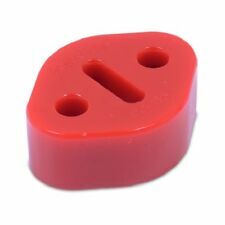 If your race car has rubber bushes anywhere in the suspension then fitting POWERFLEX bushes will improve all aspects of it's handling. Manufacturers Part Number: EXH006. Powerflex Bushes. About Powerflex. This in turn causes accelerated tyre wear, braking instability and poor handling. However that is not the whole story. When you consider the cost of fitting new bushes and the fact that POWERFLEX will be the last bushes you every fit to your car things start to look a bit better. Manufacturers Part Number: EXH013. 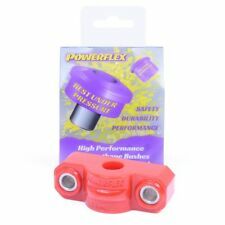 Powerflex Bushes. About Powerflex. • Ford Focus Mk1 incl. RS (up to 2006). • Focus Mk2 ST & RS (2005 - 2010). This in turn causes accelerated tyre wear, braking instability and poor handling. Powerflex Turbo Back Exhaust Mount Kit - Focus ST225 MK2. Downpipe, Cat, Centre Section & Rear Box. Manufacturers Part Number: EXH001. Powerflex Bushes. About Powerflex. This in turn causes accelerated tyre wear, braking instability and poor handling. However that is not the whole story. When you consider the cost of fitting new bushes and the fact that POWERFLEX will be the last bushes you every fit to your car things start to look a bit better. Cut to length B=44mmInstructions/Drawing. Important information. Manufacturers Part Number: EXH012. Powerflex Bushes. About Powerflex. This in turn causes accelerated tyre wear, braking instability and poor handling. Can I fit POWERFLEX bushes to my racing car?. 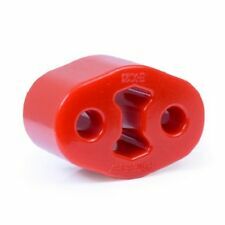 If your race car has rubber bushes anywhere in the suspension then fitting POWERFLEX bushes will improve all aspects of it's handling. Manufacturers Part Number: EXH009. Powerflex Bushes. About Powerflex. This in turn causes accelerated tyre wear, braking instability and poor handling. However that is not the whole story. When you consider the cost of fitting new bushes and the fact that POWERFLEX will be the last bushes you every fit to your car things start to look a bit better. Manufacturers Part Number: EXH010. Powerflex Bushes. About Powerflex. 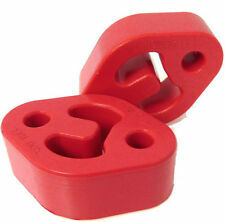 Applications: Universal - Lengths between mounting points 36mm, 64mm or 92mm. This in turn causes accelerated tyre wear, braking instability and poor handling. Cut to length B=44mm. Important information. Manufacturers Part Number: EXH002. Powerflex Bushes. About Powerflex. This in turn causes accelerated tyre wear, braking instability and poor handling. However that is not the whole story. When you consider the cost of fitting new bushes and the fact that POWERFLEX will be the last bushes you every fit to your car things start to look a bit better. Manufacturers Part Number: EXH007. Powerflex Bushes. About Powerflex. This in turn causes accelerated tyre wear, braking instability and poor handling. Can I fit POWERFLEX bushes to my racing car?. If your race car has rubber bushes anywhere in the suspension then fitting POWERFLEX bushes will improve all aspects of it's handling. Manufacturers Part Number: EXH003. Powerflex Bushes. About Powerflex. This in turn causes accelerated tyre wear, braking instability and poor handling. However that is not the whole story. When you consider the cost of fitting new bushes and the fact that POWERFLEX will be the last bushes you every fit to your car things start to look a bit better. 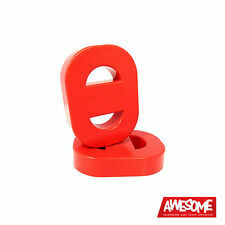 Manufacturers Part Number: EXH015. Powerflex Bushes. About Powerflex. This in turn causes accelerated tyre wear, braking instability and poor handling. However that is not the whole story. When you consider the cost of fitting new bushes and the fact that POWERFLEX will be the last bushes you every fit to your car things start to look a bit better.